There is an equilateral triangle inscribed in a circle (image on left).  What would be the dimensions (height, width) of an inscribed rectangle that has the same area as the triangle? (When the puzzle was described to me, it was quoted that the circle had a radius of two units, but I’m going to simply use r here to get a generic solution). At first glance, it looked like it would be a fairly trivial puzzle to solve, and one that, when you saw the answer, it would just look ‘right’ and obvious. As I got into solving it, however, it turned out to be a little trickier than I expected and the result did not jump out to me as being obvious. If you want to play along, stop reading now and scribble a few attempts at solving.  Below is the way I solved it. Somehow it doesn’t feel like a clean solution, and it seems over complicated. I know I’m tempting fate by publishing my solution here because I’m sure that, as soon as I do, someone is going to email me with a trivial way of solving it! Joking aside, if you can see an alternative (simpler) way of getting to the answer, please do email me. First of all some basics. The area of both shapes is A. Next let’s look at the triangle. High school taught us that the area of a triangle is half the base multiplied by the vertical height. We’ll define the half the base as is b. You might have remembered from geometry class that the center of an inscribed equilateral triangle is one third of the height of the triangle, but if not, it’s easy to prove.  The height of the triangle is the radius, plus the lower section.  A triangle in this lower section has a hypotenuse of r and an angle from the vertical of 60°. cos(60°) = 0.5, and so the lower section has a vertical height of r/2. The width of the rectangle is ≈ 1.876r and the height ≈ 0.692r (or vice versa). I don’t know about you, but those results don’t look ‘obvious’ to me when we’re dealing with such simple geometric shapes! You can find other articles on general geekery here.